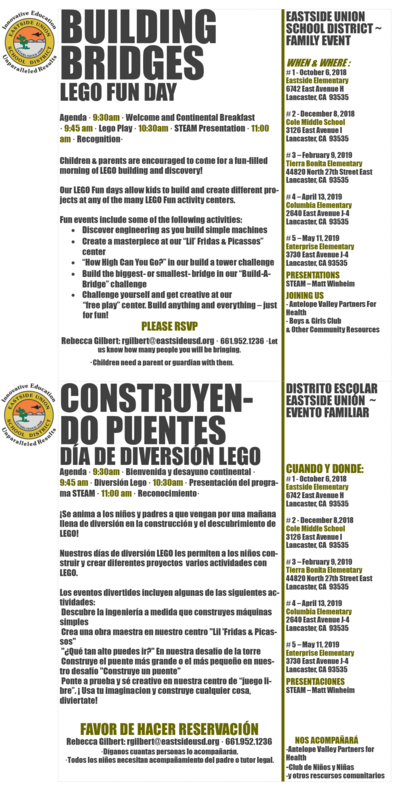 Eastside Union School District invites its students and their parents to a fun-filled morning of LEGO building and discovery! LEGO Fun Days offer multiple projects for children to build and create at any of the many LEGO Fun activity centers. Discovering engineering as they build simple machines. Creating a masterpiece at our "Lil' Fridas & Picassos" Center. "How High Can You Go?" in a build a tower challenge. Building the biggest or smallest bridge in the "Build-A-Bridge" challenge. Getting creative at the "free play" center. Please RSVP with Rebecca Gilbert at rgilbert@eastsideusd.org or 661-952-1236 to let us know how many will be in attendance. Please view flyer for dates, locations, and agenda.